For several years I've been trying to find ways to more clearly illustrate the actions and strategies of the Tutor/Mentor Connection. Over the past two years, with the help of volunteers from Indiana University Purdue University Indianapolis IUPUI, and our own eLearning and Technology Coordinator, Ariane Lee, and many volunteers, we've greatly improved the way our Cabrini Connections, Conference, and Tutor/Mentor Connection web sites communicate our goals. This week we've added another layer of information, which I believe will help more people understand what we're trying to do, and find the information they are looking for when they visit our sites. I encourage you to take some time to receive these concept maps, and consider using them to fuel your own leadership of a tutor/mentor strategy from your business or church, or in your community. We're still working on these and will continue to update them as we learn new strategies or add new information to the web site. However, we hope you find these useful and that they help guide you in your own thinking. 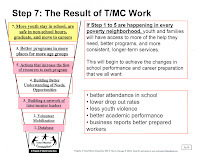 There's lots that needs to be done if more inner city youth are to be connected to tutors/mentors in comprehensive, long-term programs that mentor these kids to jobs and careers. Creating a blueprint to guild actions is an important step. Earlier this week I wrote ENOUGH is ENOUGH. A week before that I wrote about another shooting in Chicago. I've often pointed to comprehensive, mentor rich neighborhood programs as places that can surround youth with a network of adults and enriched learning opportunities, and can compete with the negative influences in the neighborhoods where the shootings take place. I've also written that there are too few such programs, and too few leaders with a comprehensive strategy to change the availability of programs. As you browse the internet over the weekend, I encourage you to reflect on the Tutor/Mentor Connection Strategy which I've begun to outline, using a concept mapping tool. If we want to stop this violence, we have to act now, and keep acting to solve this problem for many years. We have to think spatially, that is, look at the entire city and suburban problem, not just one neighborhood. At the same time, we need to act locally, because none of us has the time, or the resources to help each of the kids in the entire Chicago region who live in neighborhoods where poverty is the root cause of the violence. E – educate yourself – most of us do not live in high poverty neighborhoods, so we only understand the root causes of senseless shootings from what we read in newspapers. We also only read negative news in the media, so we’re not really well informed on where these events are taking place most frequently. Finally, while there is a perception that there are plenty of youth programs, we really don’t have a good understanding of the distribution of different types of youth programs, to different age groups, in different zip codes. The only way this will change is if each of us pledges to spend one hour a week reading books, articles and web reports, that illustrate the root causes of these shootings, or of poor performance in schools. Through our learning we can draw ideas that we use in our own actions. We can also begin to contribute information that other people use to support their own decision making. N – engage your network – find ways to draw others who you know into this shared understanding. Recognize people who volunteer time and talent, or who help kids through the programs they operate. If you are a business leader, or a church leader, engage your corporation or your congregation. You can use your web site, advertising, point of purchase materials, etc. 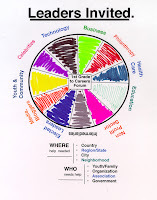 to point to web sites that show all of the agencies in the city who do tutoring/mentoring, such as www.tutormentorconnection.org. If you do this weekly, year after year, your friends, coworkers and customers will become involved in solving this problem with you. U – build a shared understanding. Form groups of peers to share reading and learning assignments, just as you meet every Sunday to read passages of scripture and build the group’s understanding of the Word of God. Use the many different resources of the http://www.tutormentorconnection.org library as the starting point for your search for wisdom, and understanding. G – give until it feels good – people who generously donate time and dollars to causes they believe in feel good about their giving. If we’re going surround kids living in poverty dominated neighborhoods with extra learning and adult mentoring networks, donors will need to give more than random contributions of time, dollars and talent. On the Bolder Giving web site (http://www.boldergiving.org/) donors are inspired to give to their full potential and those giving 50% or more are given recognition. Can we inspire donors who support youth services to give at this level? H – form habits of learning, and pass these on to your kids. Imagine how much more successful teachers were if youth came to school every day asking questions about where to find information, or how to understand information they had researched on the Internet the previous day? We can model that habit if we build it into our own activity. Keep a chart, such as the OHATS on the Tutor/mentor connection web site, where you can document actions you take each week to same sure that this time ENOUGH, really means ENOUGH. If you document actions, you can review what you’ve done at the end of each month, and each year, and begin to see a growing mountain of actions you have taken to solve this problem. Some of these will be actions that got other people involved, so that the good work you do is multiplying because of the good work others are also doing. Through this process you help build this shared understanding, which will lead to better public policy. Without this habit of learning, and without learning to use the Internet to find good ideas from people in all parts of the world, we won’t be able to problem solve as well as we need to, and we won’t be able to teach this habit to our kids. If we do this, we’ll not only reduce the root causes of youth on youth violence, we’ll also address one of the growing issues facing America in a global economy. We will begin to create a nation of learners, problem solvers, creative thinkers and innovators, who use learning and information as the basis of creating opportunity and keeping America great. If you know of a tutor/mentor program operating in your neighborhood, see if it is listed in the Program Locator at http://www.tutormentorconnection.org. If not, ask the program to contact the T/MC. Together we can create a shared library of knowledge, that helps us all understand where we have enough services, and where there are neighborhoods without services. This map shows where poverty is most concentrated in Chicago, and locations of public schools on the 2007 warning lists. In every neighborhood where there are poor schools a wide range of tutoring/mentoring, arts, technology and enrichment programs are needed. They need to be available in non-school hours and in community locations, as well as in schools and youth centers during the traditional school day and the hours between when school ends and when parents come home from work. That is the goal of the Tutor/Mentor Connection . Theconference we hosted in Chicago last week was intended to support that goal. Now that the conference is over I hope that people who attended the conference, and others who are concerned about poor schools or youth on youth violence, or workforce development, will connect with each other in small groups, or in Internet forums, where you can continue to discuss the ideas shared at the conference, and innovate ways to make more and better volunteer-based tutor/mentor programs available in the neighborhoods with poor schools. In these discussions I encourage you to learn ways to use maps to point resource providers and volunteers to programs in every neighborhood of Chicago. I encourage you to recruit leaders, who will strategically align the goals of their organizations with actions that surround kids with mentors and help those kids prepare for 21st century jobs and careers. Our next campaign is a volunteer recruitment effort as school starts. If you can apply your leadership to help mobilize volunteers, you will be making a difference in the lives of youth throughout the Chicago region and in other cities around the country. On Thursday and Friday, May 17 and 18, the Tutor/Mentor Connection has been hosting its 27th Tutor/Mentor Leadership and Networking Conference since May 1994. Our goal is to connect people who lead volunteer-based tutor/mentor programs in various Chicago neighborhoods with ideas and networks or business and professional people so they have more resources to operate programs that inspire youth and volunteers to get involved, and stay involved for many years. Very few tutor/mentor programs have celebrity leaders or deep advertising budgets. Thus, most struggle to stay visible, and to attract the operating dollars they need to pay the rent, and pay the core staff needed to support the connections of youth and adult volunteers. Thus, I'm pleased to post this graphic. It was created by Thierry Koehrlen and Clément Devaux, who are part of a very creative organization that creates illustrations like this to communicate ideas. I met Thierry over the past few months as I was organizing the Tutor/Mentor Blog Exchange and he agreed to create an illustration to help communicate the goals of the Tutor/Mentor Connection and this week's conference. I encourage you to visit Thierry's blog to learn more about the work he's doing. We invite any organization that is recruiting volunteers for their tutor/mentor program to consider using this graphic in your blog, or in a volunteer recruitment brochure. If you email me at tutormentor2@earthlink.net, or Thierry at "tk [at] nosvies.com", we can send you the jpg for this graphic. If you use it on your web site, or in a brochure, just give credit to Thierry Koehrlen and Clément Devaux at NosVies.com. We hope that you show this to artists in your own community. This illustrates how people can use their talent to help us mobilize volunteers and call attention to tutoring/mentoring. There are lots of ways for people to use their skills to help non profits. If we can unleash that talent, there's much more we can do to help kids. These are the type of ideas people are sharing at this week's conference. We hope you'll join us for the next one. Can the University provide volunteer training and why should it get involved? This is a guest article, written by Anastasia Mirzoyants, MA ESL, a member of the Owens Corning Mentorship Program Task Force, University of Toledo. The alarming observations on current conditions of American system of education as compared to educational environments and outcomes of other global communities turned fruitful for the growth of American population’s interest in volunteering in general, and public schools mentoring/tutoring in particular. Volunteerism is no more profession or age specific; it involves people of a wide variety of life paths. However, this diversified group has one characteristic in common, the one that also serves as a major reason preventing active public involvement with schools: 95% of tutors-to-be are not familiar with the curriculum and, thus, are not comfortable presenting the material to their potential tutees. This is especially true for math and science, the subjects that school children are struggling with the most but also the subjects that scare away volunteers. The apprehension individuals experience is initiated either by the absence of information or by the inability to make the information relevant to one’s activities. Thus, the most reasonable approach to reassuring tutor/mentors’ recruitment and retention is to provide them with training opportunities: to introduce them to the curriculum and help develop the skills to build it in their tutoring/mentoring sessions. The big question then is, who and how will take on the leading role in providing such trainings? There are several preexisting conditions that make the university be the most appropriate entity to function as a learning-basis for local tutor/mentorship programs. First of all, it is a vital interest of a university to ensure the consistency of well-prepared student population enrollment through raising the level of literacy and math/science proficiency among school students. Consequently, quality tutor/mentorship programs are as beneficial for the future achievement of a university as they are for the current progress of public schools. Second, being a research and innovation center of the community, the university possesses all the necessary resources including, but not limited to: materials; experiential knowledge; creative methodologies and techniques; faculty expertise, ability to evaluate an measure the program; ability to identify additional funders; and existing programs (for example, trainings and certificate programs for teachers). Thus, it seems to be efficient to utilize the resources that are already in place rather than create a volunteers’ training from the scratch. Third, by securing its place in public schools volunteering initiatives, the university gains an access to resources for further research and pilot-trials of innovative techniques. In addition, through its field presence, the university has a chance to gather more accurate information about contemporary educational context that it strives to improve. And finally, while reaching out to tutors and mentors, the university takes a step to more active and productive involvement with the community, overcomes its semi-isolated position, and improves public perception on its leadership role and social value. Unfortunately, universities are not always aware of their image within the community and the benefits of being more involved in the everyday life of local population. Thus, it is important for the volunteer-based organizations and activist groups to bring to the attention of a university administration the importance and the ways for the university to be a part of the community and pursue public interests as well as its own developmental needs. Since most people can not come to Chicago for this conference, this question is also posted on the Tutor/Mentor Connection Discussion Forum. We invite you to log in and post your responses to this question. In the May 14 Chicago Sun Times, the page 3 story headline is "They're just children. You wonder where it comes from. What causes a child to wantonly and blatantly hatch such an ill-conceived plan? What are the influences?" In the article the parents of the young man who was killed last week are "vowing to work to answer these questions, by pushing for more youth-mentoring opportunities, better gun laws, and other initiatives aimed at curbing youth violence?" That's what the Tutor/Mentor Connection has been trying to do for the past 14 years. Search for "tutor mentor" on http://www.google.com and you'll find numerous places where we're reaching out to build business, hospital and leadership support for the various volunteer-based tutoring/mentoring programs in Chicago. Look at the maps we've created that show where poverty and poorly performing schools are located, or where youth violence has led to feature articles like today's paper. At this point the biggest obstacle to a youth participating in a well organized tutor/mentor program is that lack of such programs in most areas, and the lack of a consistent flow of operating dollars to support the growth of good programs. If you're angry about this shooting and want to help Blair Holt's parents find these answers, you can spend an hour a week reading about the problem, and learning about what types of volunteer based programs might help kids make better choices with their lives. Visit the Links section on the T/MC site and get familiar with the various categories of information that you and your friends and co-workers can use as resources. Or, come to the Tutor/Mentor Conference this Thursday and Friday and meet some of the people leading these programs. Start your learning there and keep learning on a daily, weekly and yearly basis. There is no quick fix to this problem. It takes several years of consistent work for a volunteer-based tutor/mentor program to build the trust and participation of a core group of youth, families and volunteers. Few programs can do this if they don't have funds for space, or consistent staff, or for learning from others so they can innovate ways to make these programs work. If public and private sector donors don't step up to provide the funds, there won't be much change in the availability, or quality, of mentoring for youth. Which means we'll be reading this story again and again. Only the names and places will change. The headlines of the Chicago papers this week tell of the tragedy of five teens who were shot in mid afternoon, while riding a bus on the way home from school. One teen died, saving the life of another. On the radio this morning I heard the Chief of Police ask "What does it take to raise our anger about this?" I've been asking the same thing for the past 14 years. If you search Map Quest for the location of Percy Julian High School,10330 S Elizabeth St., Chicago, IL 60643-2394, which the teens attended, you'll see that the school is near 103rd Street, and right near Route 57 highway, which brings several hundred thousand people from the suburbs into the Chicago LOOP to work every day. If you search the Tutor/Mentor Program Locator for the 60643 zip code, and narrow your search to programs serving high school youth, you'll see that our database only lists one small organization in the area of the high school. Thus, my question is, "What will it take to get a few thousand of those people driving past this neighborhood every day to take an hour or two a week to help build comprehensive, mentor-rich, non-school tutoring, mentoring and learning centers that would compete for the participation of the kids who become dropouts and later are attracted to gangs?" If you know of people who are concerned about this issue, not just in the 60643 zip code of Chicago, but in the other high poverty neighborhoods of Chicago, Aurora, Rockford, Detroit and other cities around the country, we're holding a conference on May 17 and 18, and one of the panel discussions addresses violence prevention. Others talk about ways to build and sustain the types of programs that are needed in these neighborhoods. If you spend just a little time each week learning about these issues, then you'll be less likely to drive by them as you pass through these neighborhoods coming and going to work every day. You can be come a leader and you can connect your own network, so that we begin to build comprehensive, long-term solutions that reduce the number of tragedies like this. 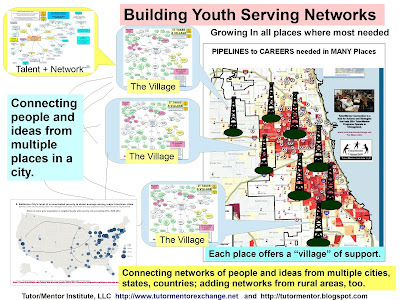 The graphic at the right illustrates the T/MC role in building a Network of Purpose. This is one of many short essays in the Tutor/Mentor Institute that describe the Tutor/Mentor Connection's role in building a network of purpose. Notice that we're at the bottom of this pyramid. If you were reading Harvard Business School articles on theory of leadership, you'd see this same example, where the leader of an organization is inspiring and empowering all of the members of the organization to focus on common goals. Ours is a virtual organization. Less than 5 people work on the T/MC and Cabrini Connections staff. Thus, we're reaching out to people all over the world who have the same concerns for kids living in poverty, or for workforce development and diversity. The first step in this process is building a database of people who operate tutor/mentor programs in Chicago, or who are in some way involved, or interested. Without this database we cannot send out invitations for people to visit our web sites, or come to our conferences. We also cannot create a Program Locator service that helps volunteers, donors and parents find tutor/mentor programs in Chicago. The Blog Exchange that we're now hosting is part of an on-going strategy of building the database. The Conference on May 17 and 18 is also part of that strategy. However, it goes to the next step of helping the people in the database begin to know and share ideas with each other. If we can keep programs coming together often enough, they will beginning to build their own networks and relationships, which can lead to better sharing of ideas, and more willingness to work together to increase resources. If we do this long enough, and in enough cities, the end result can be what everyone wants, which is kids who do better in school, are better prepared for work, and are better citizens and contributors to our society. However, we can't do this without the work at the base of the pyramid. I encourage you to read what Habib Rose is writing about networking and how this relates to connecting volunteers and leaders of tutor/mentor programs with each other. The session resonated with me because Herbold was talking about how business needs to be constantly alert to market changes, trends, and competition and how they need to stimulate innovation and speed the way decisions are made and ideas come to the market. This is exactly the type of thinking and leadership we need form non profits, philanthropy and business leaders if we're to innovate new ways to connect with inner city kids and build habits of learning, problem solving and innovation, that make millions of under-prepared youth part of the 21st century work force. Yet, it seems to be more difficult to get these leaders into the Tutor/Mentor network than it is to drag dinosaurs out of a pool of tar. This is why what Habib is writing about is so important. We need to learn to network, and connect our networks, at the neighborhood level, and at the virtual level, where people from different places, who care about the same causes, can be meeting together daily to solve problems and innovate new ways of doing business. Volunteers. Tutor/Mentor Leaders. Donors. Make the Connection. A few months ago I started searching the internet for other tutor/mentor programs who were using blogs to tell their story, or using blogs to connect their readers with the Tutor/Mentor Connection. I've not found many tutor/mentor programs yet, but have connected with a few others who are helping me spread the word. Neighbor Networking , Gift Hub and the Smart Communities wrote about the Tutor/Mentor Blog exchange in their blogs. On April 17, the Chronicle of Philanthropy Give and Take Blog wrote about an article that we started on this blog. As a result of this networking, Paul Perena did an interview for his Blau Exchange site. We've started several blogs out of Cabrini Connections which you can see here, here and here. Our interns and college volunteers have also created blogs, such as The Beginning: Blogging as a Volunteer and here. This led me to be contacted by Vermont Mentoring, who launched their own blog just a few days ago. As a result, our own Cabrini Writing Club is reaching out through their own blog, to create an exchange between our Chicago program and other programs in other cities. What's our goal? By connecting leaders, volunteers and donors who support volunteer based tutoring/mentoring, or education to careers and other programs that build connections with adults, and provide learning activities that stimulate creativity, problem solving and critical thinking skills, we build a network of people committed to a common purpose. The first step in network building is always the hardest. That's finding all the people who you want to be connected with each other, and finding a way to communicate to them often enough that some begin to respond. This is not a short term process, and if no one maintains the data base, it's difficult for anyone to be reaching out to build this network. The network of bloggers is growing. We hope it leads to more participation in the May and November conferences and that this leads to actions that help more and better programs be in place as we stat school again in August and September. If you are telling your tutor/mentor, arts or technology story with a blog, I encourage you to join us and help us expand this network. I received a note yesterday from Vermont Mentoring. In today's post they wrote, "Since we have been blogging for an entire 5 days now, we thought it would be a good time to give you a clearer picture of what we actually do." 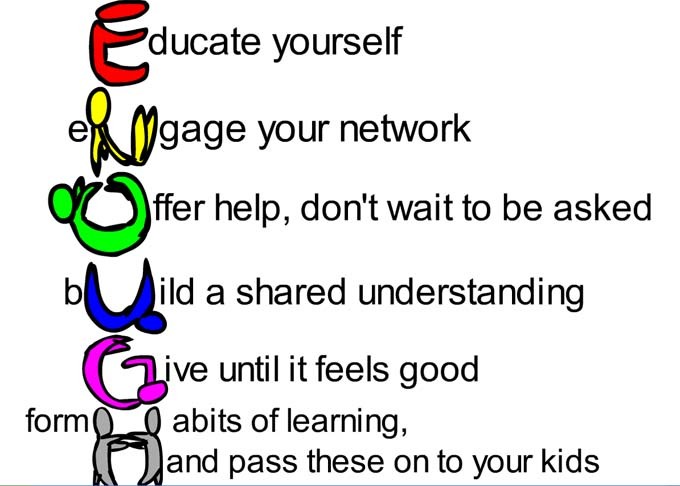 This is what we hope mentoring programs all over the country will do. We don't have much money for advertising. We don't have money for long-term research and evaluation. We do have stories. If we connect our stories, in blog exchanges, or linked web sites, we draw more attention to our programs, and this serves as advertising, and builds public understanding of who we are, where we are and what we do. 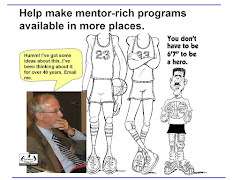 It helps us attract the volunteers and donors and other resources we need to keep creating mentoring and tutoring experiences that we show on our web sites and blogs. If you've not created a blog, why not so what Vermont Mentoring did, and start one this week. If you write about the goals of the conference we're hosting in Chicago on May 17 and 18, we'd like to list you as part of the Tutor/Mentor Blog Exchange. At the right is a graphic I created a few months ago to illustrate how leaders from every industry need to be engaged in building strategies that mentor kids from high poverty neighborhoods to jobs and careers. Most of the people who read this don't know me. However, if you've been in a conversation with me you have seen me illustrate my ideas on paper as we're talking. I was doing that again today in preparation for a meeting with a prospective board member for Cabrini Connections, Tutor/Mentor Connection. As I did this, I was asking myself, "what is the role we want from our leaders"? I've published a short essay titled ROLE OF LEADERS and it illustrates actions that leaders of business, or professions, or universities could take. However, I think it misses a point. What I want leaders to do is spend time learning about the issues, then combining this learning, with their own work and life experiences, to do just what I do. Sit down with a piece of paper and try to illustrate your own vision of what steps you and others need to take to help more and better tutor/mentor programs be operating in poverty neighborhoods, as workforce development and diversity partners, of your company or your university. I've been drawing diagrams and sketching ideas for more than 14 years. Why? I began to realize that while many people understand my enthusiasm, they don't understand my ideas. Thus, I began to try to visualize these ideas. You can find many examples in the Tutor/Mentor Institute section of the T/MC web site. If you click MAPS in the lables section below, you'll find a few more examples. What I've learned is that I understand what I'm doing better and better each time I try to create an illustration to help someone else understand my vision. Thus, if I can recruit other people who will make the attempt to visualize their own understanding of the Tutor/Mentor Connection, or of a workforce development strategy, or of what a pipeline to careers really means, I think this will give these people a greater ownership of this problem, and of the many different solutions that are possible. In the LINKS section of the T/MC web site I have a sub section on Innovation and Creativity. I've learned that perspiration is what leads to inspiration and that the more you can learn from how someone else is solving a problem, the more inspiration you have to solve the same problem. If you want to be a leader, of the T/MC, or of your own life, I encourage you to spend time each week reading some of the information we've posted on innovation and creativity. Then, I encourage you to begin mapping and visualizing your own beliefs, and strategies. As you do this, share your ideas via a blog, or a web site, or in face to face brainstorming with others who are trying to solve the same problems. When our leaders are putting in this level of learning, and critical thinking, and problem solving, our solutions and their leadership will be more effective. This is not something that you can delegate. It's something you need to role up your sleeves and do for yourself. What do you think? Is this your idea of a leader? If this is your style of leadership, I encourage you to join us at the May 17 and 18 Tutor/Mentor Leadership Conference. If you blog these topics, why not write about this in your blog?